Tracks as standard version. The CD is bright yellow. There is no writing on the disk, except for the copyright info. 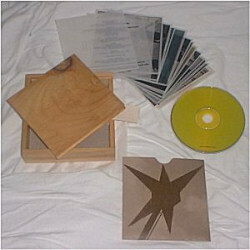 Package Description A a wooden box containing 16 translucent plastic pictures. The CD is housed in a sleeve. Product ID: Warner Bros. 45763-2.